There’s a lot about President Theodore “Teddy” Roosevelt most of us have forgotten since high school history class. We know he liked to quote the proverb, “Walk softly and carry a big stick,” but may not recall he wasn’t elected to his first term but took office with the assassination of President William McKinley. Roosevelt ensured the construction of the Panama Canal, he won the Nobel Peace Prize for mediating the Russo-Japanese War—and, of course, he’s the namesake of every child’s most loyal companion, the Teddy Bear. These soft and cuddly creatures will be celebrated once again in New Milford June 3 at the Woman’s Club of Greater New Milford’s 21st Annual Teddy Bear Festival. It will be held on the Town Green from 10 a.m. to 3 p.m. and admission is free. Cramer & Anderson is a proud Red Level Sponsor of the festival, which is the highest level of sponsorship. “Support from Cramer & Anderson, LLP, as well as other leading businesses, allows the Woman’s Club of Greater New Milford to achieve the full potential of its fundraising efforts,” said Shannon Richard, President-Elect of the Woman’s Club. This year’s festival will showcase more than 40 vendors, including at least eight food vendors, and nine other nonprofit organizations. A marquee feature of the festival is the Teddy Bear Hospital and Adoption Center, and big draws for children include an expanded game section with a bounce house, and live demonstrations and entertainment throughout the day, including the Teddy Bear Parade at Noon with Smokey the Bear. Games will include prizes at the end of the day. The Teddy Bear Festival is the Woman’s Club’s largest fundraising event, drawing 2,500 to 3,000 guests. The Woman’s Club is part of the General Federation of Women’s Clubs and is dedicated to Living the Volunteer Spirit through raising funds and supporting projects throughout the community. All programs are funded through donations, volunteering, and fundraising efforts of the club. Each year, The Woman’s Club provides funds to more than a dozen other non-profit organizations, including the Youth Agency and local animal shelters. The club funds at least two scholarships annually based on community service and volunteerism. In addition to The Teddy Bear Festival, the Woman’s Club creates a giant Fourth of July Cake for the community, and provides Thanksgiving meals for over 200 families each year. See the club’s website or Facebook page for more information. 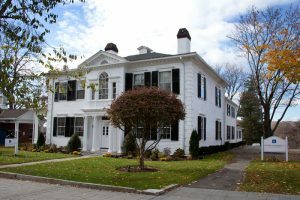 The largest law firm in northwestern Connecticut, Cramer & Anderson offers sophisticated legal services, close to home, in nearly 20 Practice Areas, including Personal Injury, Elder Law, Estate Planning, Probate & Trust Administration, Divorce & Family Law, Real Estate, and many others. The firm has offices in New Milford, Litchfield, Danbury, Kent and Washington Depot. To learn more, call the New Milford office at (860) 355-2631, or see the website at crameranderson.com.